I'm Passionate about creating well-crafted, visually engaging and highly usable digital experiences. I have 10+ Years in web design & development at advertising and digital agencies, plus a number of years running my own consultancy. I also bring an extensive background in design that has proven invaluable when contributing to the design process and communicating with creative teams. Currently, I'm a WordPress consultant extremely active in the WordPress community. leveraging WordPress, Gutenberg and React to empower your Marketing Team. Atomic design & Modular development specialist. Speaker, Developer & Designer. Wait what is a block you ask? A Gutenberg block is a collection of fields that output data wrapped in HTML saved to your post content. Similarly to how TinyMCE controls currently work without being tethered to What I consider a limited TinyMCE API and lack of documentation. In addition, Gutenberg blocks are completely modular and reusable across your projects. As a developer, I’m fully behind WordPress decision to go this route. I have developed custom TinyMCE controls and custom Gutenberg blocks. In my opinion, Gutenberg is more flexible and covers more use cases than TinyMCE. The only advantage I would give TinyMCE is a learning curve as the syntax for creating a custom control is similar to and utilizes jQuery. In order to create a Gutenberg block, you do need to learn React.js. Because Gutenberg can do everything that TinyMCE can do and then some, I’m going focus on what’s new in Gutenberg for the rest of this post. 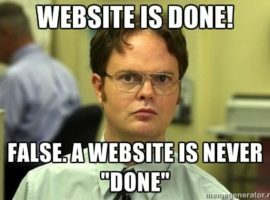 By Morten Rand-Hendriksen in where he calls outs our current WYSIWYG solution in WordPress proclaiming “We can do better”. I agree, yes we can. For editors using the current WYSIWYG solution in WordPress powered by TinyMCE, you will have to agree, we are not exactly achieving “What you see is what you get” experience. When updating a post you don’t really know what you are going to get until you preview or publish. Gutenberg is an attempt to enhance the WYSIWYG experience. How do you ask? Gutenberg allows you to render the HTML and CSS in the post editor screen giving you a more realistic representation of the content. So what would be the difference for content editors if editing a post with Gutenberg block versus TinyMCE? In-line editing. Which is becoming a popular user-interface concept widely adopted by Medium, Linkedin, and Facebook. The basic idea behind in-line editing is to allows the user to change content directly within its display view. Allowing for a more intuitive interaction rather than being redirected to a separate edit screen, which often is jarring for the user. Sidebar with context. Each content type now has optional additional context fields. For example, Headings come with size, color, background color context. In tandem with in-line editing allows you to see how these options are affecting your post style in real-time. Add a block and then format or add styles to it as per your preference. Once you’re done with the formatting of the block, click on the three vertical dots to the right of the block. Click on Convert to reusable block. Once the block is saved you can access it from the blocks menu at any time. If you ever need to make changes to the block and then save it as a different block, simply detach the block, make your edits, then convert it a reusable block again and name it differently. That completes our tutorial on saving reusable blocks in the Gutenberg editor. In my opinion, moving away from TinyMCE is a huge upgrade for WordPress. Gutenberg is adding flexibility, customization, and a better user experience. Ultimately, you will have to decide if Gutenberg is right for you. The good news is you can switch to back TinyMCE anytime, using the Classic Editor plugin. This entry was posted in Web Design, Web Design Industry People Blog, Web Development. Bookmark the permalink. 1 Comment on "TinyMCE vs. Gutenberg – What’s Changed"